I was surprised to learn that my sister Dawn had never been to Costco. Luckily, I never leave home without my Costco membership card – you just never know when you’ll need to buy massive quantities of something. I took her on a field trip through the massive store at the Jersey shore, with the knowledge that we’d need large amounts of paper products to get us through the summer. As we approached the produce department our eyes caught sight of the most beautiful-looking apricots outside of Armenia – or so I’ve been told. We simply had to buy them! 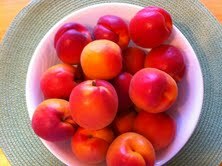 Not only were the apricots gorgeous, they were delicious, too. We ate most of them as they were, but saved a few of the softer ones for cooking. 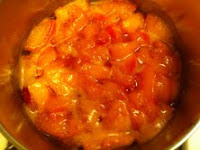 Dawn sliced the apricots, tossed them in a saucepan with a little honey, a squeeze of lemon juice and a dash of cinnamon and let everything cook gently until the apricots were tender and the juice became slightly syrupy. Served over a scoop of thick, plain yogurt and garnished with fresh mint from the garden, it was a perfect summertime treat! I'm excited to have come across your site, thank you! I'm without my grandmother's Armenian cookbook making stuffed peppers, and your dolma recipe is exactly how she taught me to make them. I'm also going to try the apricot dessert, sounds perfect for apricots I've been wanting to use for a sweet treat. I also appreciate your husband's book cover photo. It's strikingly similar to a (Chouljian) family photo of my grandmother and great aunts and uncles, taken I believe just before they had to flee Gurin in 1915. 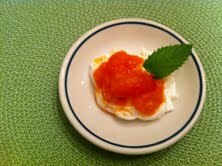 Thank you both for sharing - it's true our personal Armenian stories and food are uniting and heartwarming. Thank you for your comment, Tanya! Interestingly, I had relatives with the surname Chouljian. Did your Chouljian relatives reside in California?